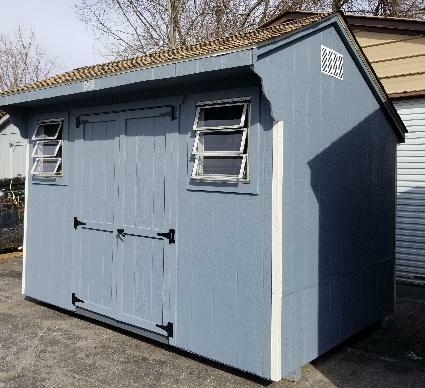 This is a stock used 7'8" x 10' Carriage painted blue with beige trim. There are 4' double doors painted blue with blue trim. The roof is shakewood. There are two windows with beige shutters. There are a pair of metal peak vents and diamond plate sill at the doorway. All our Used Sheds are Sold As-Is.